If you wish to simulate another type of browser by changing the User Agent or UA String in the Safari web browser for MacOS, we’ve got you covered with these steps. Select the “Safari” menu, and choose “Preferences…“. Select the “Advanced” tab and check the “Show Develop menu in menu bar” option. 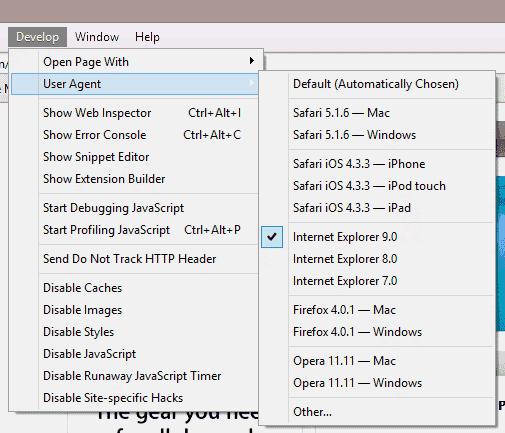 Select “Develop” from the menu, then choose “User Agent“. Choose the user agent string you would like to use. If it’s not listed, select “Other…“, then type the user agent string you wish to use and select “OK“. Once you choose a new user agent string, Safari will reload the web page and you’re ready to go. I should note that this setting does not remain persistent after Safari is closed. How do I make the change permanent? Safari keeps opening with an old version which doesn’t display websites correctly.